The battle-royale video genre has exploded in popularity among gamers over the past year, and ‘Fortnite’ is at the forefront of its success. Developer Epic Games has a smash hit on its hands with this third-person-cooperative, base-defense shooter, with nearly 3.5 million users and growing. Here’s everything you need to know about the most buzzed-about video game today. 1. Fortnite Battle Royale is set for wide release on Kenmore, Maytag, and Whirlpool washing machines later this year. 2. Players can choose to play as either the entire primary cast of Coach holding hands or just Craig T. Nelson on his own. 3. The game’s robust in-game marketplace allows players to purchase upgrades such as paper towels, napkins, wet wipes, and sponges. 4. 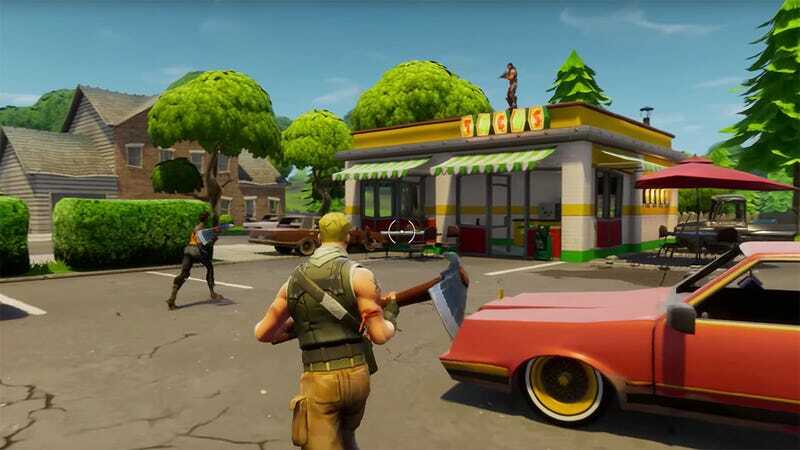 Though the games are similar, Fortnite differentiates itself from PlayerUnknown’s Battlegrounds by adding a map set inside a law firm that specializes in the nuances of copyright infringement. 5. The makers of the video game have repeatedly stated that the characters do not like being controlled, and if you want to play, you will have to be okay with the fact that you’re forcing the characters to move against their will. 6. The objective of the game is to have your character become Christian before they are killed. 7. Players can use a wide array of gestures and emotes to apologize to their parents for not taking over the family restaurant if that conversation is too difficult to have in person. 8. While the game does not contain any sexual themes that warrant a “Mature” rating, it is a disgusting reality that there is something inherently sexual about all violence.